Where have all the mega-deals gone? There’s certainly been a dearth of deals since year-end. It’s been a long time since I’ve opened up the newpaper in the morning and seen any front-page headlines about a new deal. In fact, it’s been more about cancelled deals (IPOs such as New Look, Travelport and Merlin) or more about last year’s deals (such as Kraft / Cadbury and their final agreement). So it was encouraging to see a monthly briefing report by Regent Corporate Finance Services that talked of an increase in at least one section of the market, European technology, which fortunately also would tend to be a leading indicator of future volumes in other industries as technology is often one of the first in a new merger cycle (after the large cyclical businesses such as pharmaceuticals). It particularly nice to see the participation again of the financial sponsors such as the private equity firms … who have been missing from the market since mid-2007 but who had been so important to the growth of the last merger wave that started in 2004. Let’s hope this pace continues and that the small- to medium-size market will kick-start the upper, and more public, M&A market as the year progresses. M&A Volumes were up, but what’s happened? 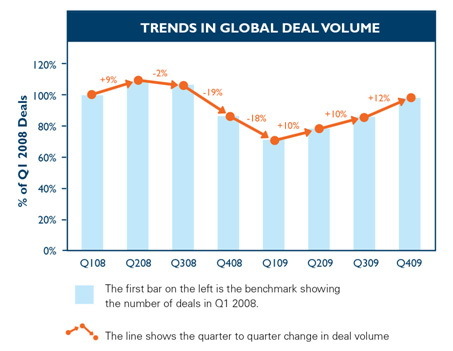 Typically, the volume of deals in the first quarter of the year are higher than at other times of the year. In fact, if you look at the largest deals since the mid-1990’s (all around $60 billion or more),over one-third of them were announced in January and almost half in the first quarter. Obviously, we didn’t hit the January figure this year, but could still be heading for the first quarter figure if markets settle a bit (perhaps the political interference this year has affected January). Also, two-thirds of all these mega-deals were announced in the first half of the year. I’ve looked at the figures slightly differently (that is, all deals over £10 billion), and the figures aren’t quite as skewed, but still directionally the same. These gains in the equity markets have continued to help narrow the valuation gap that has existed between buyers and sellers and free capital sources globally. But there are other factors involved as well, principally from the behavioural side that are holding back a strong resurgence. More on this in another blog.